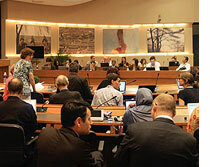 There was no conclusive decision on discussing hydrofluorocarbons (HFCs), used as coolant gas in refrigeration, as parties trudged to the finish of the 25th meeting of the parties to the Montreal Protocol at Bangkok (MOP 25) on October 25. 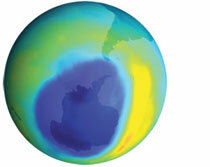 Whether these gases should be discussed under the Montreal Protocol that addresses ozone-depleting gases, was a key agenda for discussion at the outset of the meeting. At present, HFCs are handled under the UN Framework Convention on Climate Change (UNFCCC) since they are greenhouse gases (GHGs) with high global warming potential. Their emissions are on the rise as they have started replacing ozone-depleting substances called hydrochlorofluorocarbons (HCFCs) and chlorofluorocarbons (CFCs), which are handled under the Montreal Protocol. As the Montreal Protocol Meeting of the Parties (MOP 25) entered the second day of discussions on Tuesday, South Africa called for setting up a formal contact group to discuss how the problem of hydrofluorocarbons (HFCs) can be addressed under the international treaty. (For an official decision to emerge from the Protocol, an issue first needs to be formally discussed under a contact group.) By doing so, South Africa broke ranks with other BASIC (Brazil, South Africa, India and China) countries that are opposed to setting up such a contact group on HFCs under the treaty. 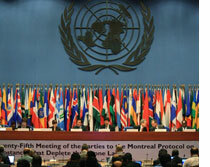 China, member of this coalition of emerging economies, called for a formal discussion group, talks under which are not legally binding upon parties to the Montreal Protocol. On the opening day of the Montreal Protocol when co-chair Patrick McIrney from Australia introduced the agenda and asked for its adoption, there was silence in the room for a minute. It was almost as if he spoke a second too soon before the Indian delegates sought to intervene. 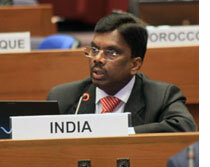 India wanted the agenda item for discussing hydrofluorocarbons (HFCs) under the Montreal Protocol deleted. The Indian head of delegation, A Duraisamy, said: “The Montreal Protocol is a specific treaty for phasing out production and consumption of ozone-depleting substances. The proposed amendment to discuss HFCs, which is not an ozone-depleting substance, has been discussed 'n' number of times and parties have not been able to reach an agreement. Hydrofluorocarbons (HFCs), coolant gases, are a hotly debated matter now and have climbed to the top of political agenda of leading premiers in the world in recent months. Whether these gases should be discussed under the Montreal Protocol that addresses ozone-depleting gases is a key agenda item for the week-long 25th Meeting of the Parties to the Montreal Protocol (MOP 25) that opens Monday in Bangkok, Thailand. At present, HFCs are handled under the UN Framework Convention on Climate Change (UNFCCC) since they are greenhouse gases (GHGs) with high global warming potential. Their emissions are on the rise as they have started replacing ozone-depleting substances called hydrochlorofluorocarbons (HCFCs) and chlorofluorocarbons (CFCs), which are handled under the Montreal Protocol.